Emory Remington (1892-1971), professor of trombone at Eastman, is recognized as one of the most outstanding brass instrument pedagogues in the world. In almost 50 years at Eastman, he taught hundreds of students who went on to hold positions in virtually all of the country’s major symphony orchestras, as well as in college music departments and schools. A member of the Eastman School faculty from 1922 to 1971, Remington was regarded as one of the University of Rochester’s master teachers. 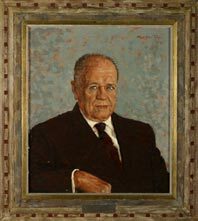 He was awarded the University of Rochester Alumni Citation to Faculty in 1957, and the Edward Peck Curtis Award for Excellence in Undergraduate Teaching in 1968. Mr. Remington also received a National Honorary Membership Award from Phi Mu Alpha Sinfonia and, in 1967, was honored as “Musician of the Year” by Mu Phi Epsilon. A member of the original Eastman Theatre Orchestra, Remington served as first trombonist of the Rochester Philharmonic and Civic Orchestras until the 1948-49 season, when he retired from his orchestral posts to devote himself to full-time teaching at Eastman.